The Sparta 1 mini winder is AC powered - No batteries are required. 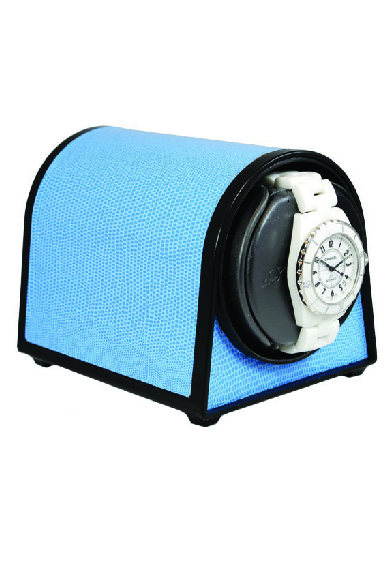 Although the size is MINI, the performance of this very affordable watch winder is MAXI. Operating on safe low voltage with a wall plug-in transformer, the motor and gearing system is what makes this AC design unique. Orbita has coupled together an AC synchronous motor with a gearbox that reduces output speed to an unbelievably slow six revolutions per hour. Consequently, the output speed is only one revolution every 10 minutes. That is the same time cycle as in battery-operated DC versions, which has been proven to successfully wind virtually every automatic mechanical watch we've ever test. The winder is absolutely silent in operation and perfect for bedside use. This mini case has a Blue faux leather finish.